It is iconic and well known. 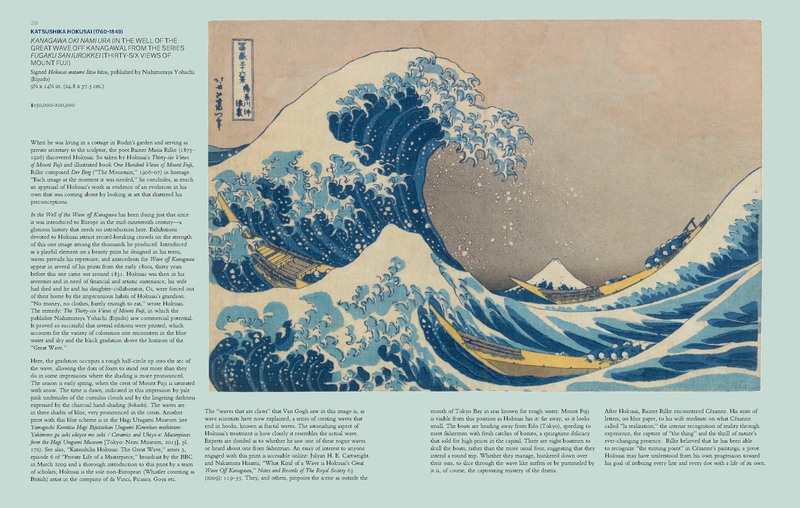 Whether adorning a t-shirt, gracing the wall of a home as reproduction, being studied in staid rooms of museums the world over, or even adorning flesh as tattoo the work known as ‘Under the Wave off Kanagawa’ by Japanese artist Hokusai is without doubt widely recognized and admired. 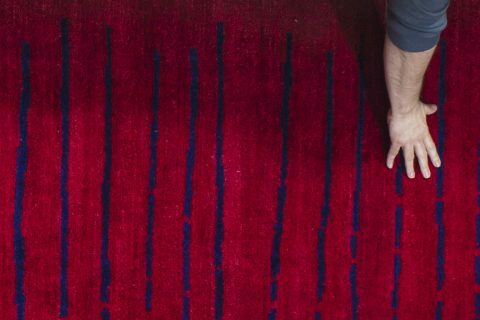 It is now also, thanks to the efforts of UK Heritage Rugs, a rug which dutifully replicates the original woodblock print in textile form; specifically a Nepali-Tibetan carpet aptly titled: ‘Wave’. 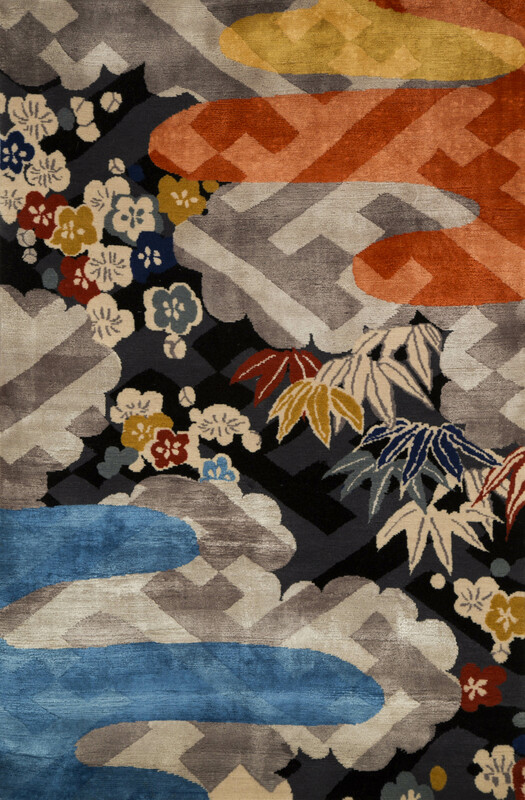 ‘Wave’ by UK Heritage Rugs was inspired by the woodblock print ‘Under the Wave off Kanagawa’ by Hokusai from the collection of the British Museum amongst others. | Image courtesy of UK Heritage Rugs. 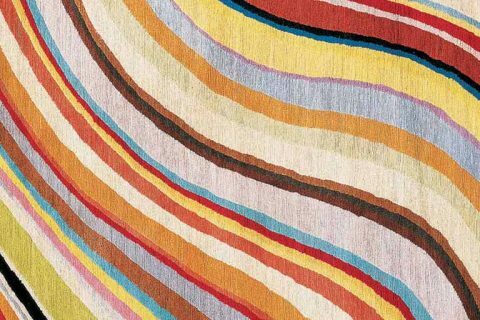 Based on the impressive globe-spanning cultural holdings of both the British Museum and the Victoria and Albert, or as they fancy themselves the V&A, ‘Wave’ is but one (1) of an entire collection of rugs and carpets given genesis by UK Heritage Rugs. It is perhaps the most interesting as well given both the nature of the original woodblock and the nature of our human use of rugs. In examining ‘Under the Wave off Kanagawa’ which is also known as ‘The Great Wave’ and its modern licensed reproduction ‘Wave’ one is reminded of the title of the biographical documentary on the inimitable Diana Vreeland: ‘The Eye has to Travel.’ And indeed, it does! There is much to examine in ‘Wave’, but how we do so is dictated by how our eyes travel. Viewed or read from left to right as is customary in many languages the viewer is the wave, in a position of unmitigated power over this composition. From right to left as is customary in many other languages the viewer cannot help but feel impotent in the face of the unimaginable power of nature. As a rug on the floor then one can either enter stage left or stage right for similar emotional reactions, experiencing the same rug – or artwork – quite differently merely as a matter of perspective with all of this conjecture intentionally ignoring the incomprehensible power of the distant volcano on the horizon. And so while this is simply a perfunctory look at the beauty of these carpets – for one would be foolish to argue against the aesthetic value of such renowned work – the raison d’être of both UK Heritage Rugs and of licensed museum collections such as this, is of more interest to this commentator particularly how in this time one chooses to view an empire in retrospect, without necessarily presenting multiple perspectives. 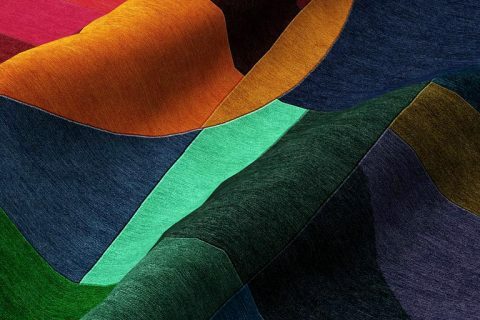 ‘Cirrus V’ by UK Heritage Rugs was inspired by a Japanese Kimono. | Image courtesy of UK Heritage Rugs. In speaking with UK Heritage Rugs’ Principal Brian Sales during Domotex it was apparent his passion, no, his calling, no, his mandate was not to be euphemistically inspired by the work of others – as is the purported case of so many who knock-off the work of others, but rather it was to honour the originals. By working closely with the curators who oversee the works his firm licenses Sales was able to ensure – as best possible given no-one involved created the originals – the carpets present the artwork in a manner befitting the originals’ museum quality status, however the reader prefers to interpret that. Without hesitation Sales has succeeded in this regard, though whether or not the firm’s carpets themselves are ‘museum quality’ is an academic question left for the reader and future curators. Further, given the firm’s carpets are GoodWeave certified, they have likely produced rugs under conditions superior to those under which some of the original works were created, though it should be noted this latter comment is pure speculation and highly revisionist. But to what end and whose benefit? This question is asked somewhat literally, somewhat rhetorically as this commentator is still not fully decided on what the correct answer is. Surely each museum receives a royalty as they have officially licensed the artwork to UK Heritage Rugs, and just as surely the firm, its manufactory in Nepal, the weavers, Mr. Sales himself, and others involved have or plan to receive some renumeration for their efforts. One could further argue even those who purchase a rug from UK Heritage Rugs benefit insomuch that world-class beauty has been replicated specifically for them and those who gaze upon the works to admire. Surely the spread of undeniable beauty is a benefit to society en masse, but these arguments come from the metaphorical left without regard to those looking up at the wall of water. This is vestigial of empire and dominion, without regard to modern sensibilities, particularly of emerging generations. Hokusai, the long dead Japanese artist, nor his heirs or assigns benefit. Nor does in fact say The Metropolitan Museum of Art in New York which also has a copy of ‘The Great Wave’ or The Art Institute of Chicago which boasts several in its collection. One could rightly, easily, and correctly argue The Met has just as much ‘right’ to exploit said work, and they do, just not in carpet form… …yet! 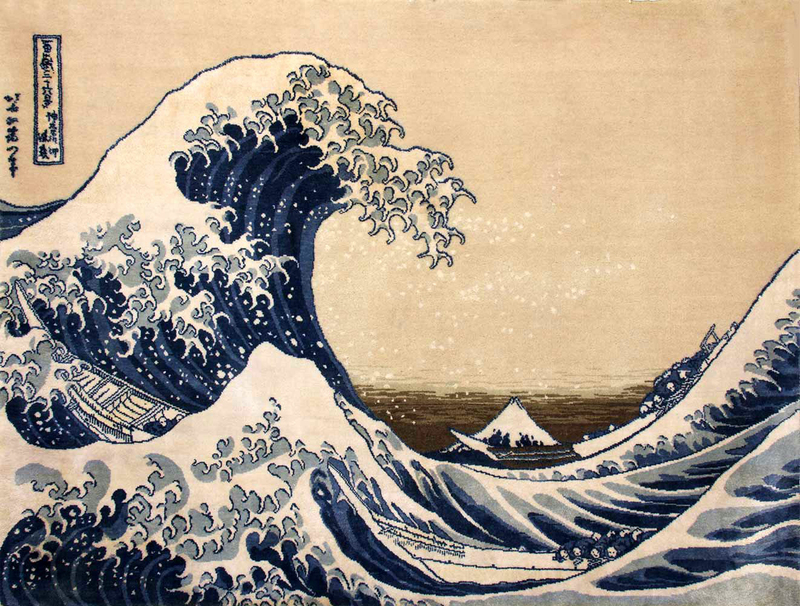 For example, imagine one wants a scarf emblazoned with an image of ‘The Great Wave’. Does one choose this one from The Met or this one from the British Museum or any of these – one would wager to assume unlicensed versions – from Etsy? So now imagine for a moment a favourite fictitious rug company ‘Mister Carpet’ approaching The Met and creating a licensed rug from their copy of the print. How does this then relate to UK Heritage Rugs’ ‘Wave’? For that matter, if one was so inclined an original print of ‘The Great Wave’ could even be purchased and used for reference (see below). Moreover, what if in what is a more probable scenario, ‘Mister Carpet’ decides to forgo licensing altogether much the same as those Etsy shop owners? Is this imagined unlicensed pastiche carpet verboten simply because it does not possess the borrowed credibility one associates with museum licensed products, that is licensed museum collections? Kanagawa Oki Nami Ura (In the Well of the Great Wave Off Kanagawa) as shown on pages 39-40 of the catalog for the Christie’s auction ‘Japanese and Korean Art – 18 April 2018’. | Image from the catalog. Fair use by The Ruggist. Several learned colleagues have expressed to this commentator their opinions that museums granting direct physical access to holdings and access to expert-level knowledge in exchange for licensing is beneficial both to museums as it brings in revenue, and to the average citizen as it allows work that may perhaps never be on public display to see daylight, if you will. On the other hand, the nature of copyright is such that modern society chooses to extend the rights of current creators well into the uncontrollable future while simultaneously ignoring that a great deal of what is ‘created’ today is built solidly on the work of the past, which if hypothetically given the same contemporaneous legal treatment could potentially still be under copyright protection. UK Heritage Rugs and indeed many others who create licensed collections from works whose copyright is in the public domain are doing a great service by airing these works and the underlying financial benefit to the museum or institution is without doubt. Caution however must be heeded so that conflation of physical possession of a work with that of ownership of the copyright does not occur, as could so easily become the case. Depending of course on your perspective.